Welsh boxer Enzo Maccarinelli will face former four-weight world champion Roy Jones Jr in Moscow on 12 December. There were reports ex-WBO cruiserweight champion Maccarinelli, 35, and Jones, 46, would fight for the WBA 'super' world cruiserweight title. But the WBA said this was a "false rumour", in a quote attributed to president Gilberto Mendoza. Mendoza also told BBC Sport: "There is no approval for the mentioned fight from the WBA." He added: "It has not been requested to the championship committee." Neither Maccarinelli nor Jones Jr are rated in the governing body's top 15, with Russian Denis Lebedev the WBA champion since 2012. Jones's last defeat was by Lebedev in 2011, while Maccarinelli has competed at light-heavyweight in recent years. American Jones is one of the greatest fighters of the modern era and in 2003 became the first former middleweight to win a heavyweight world title for 106 years. However, he has not held a world title since 2004, when he lost his light-heavyweight title to compatriot Antonio Tarver. The Welshman last fought for a world title in April 2014, losing to WBA light-heavyweight champion Jurgen Brahmer after suffering a badly cut eye in an early clash of heads. But he got back to winning ways with a first-round stoppage of Gyorgy Novak in Manchester in March 2015. "There's always been a lot of doubters. 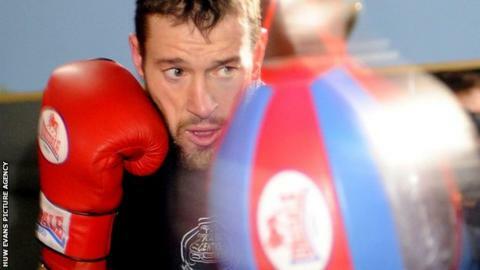 This [beating Jones] would prove a lot of the doubters wrong," said Maccarinelli's trainer Gary Lockett. Jones, who is originally from Florida, officially became a Russian citizen after he was presented with his Russian passport in Moscow on Tuesday.